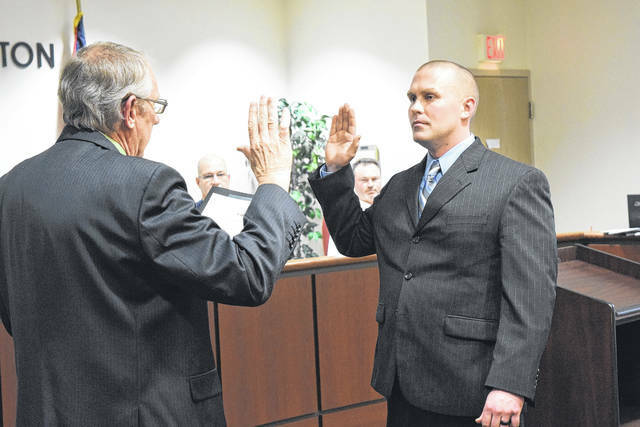 Jamison Kuenkel was sworn in as one of the City of Eaton’s newest part-time police officers during an Eaton City Council meeting on Monday, Feb. 19. It was explained Kuenkel had recently graduated from the Police Academy and that he is starting his police career with the City of Eaton. The other new part-time officer to be sworn in during the council meeting on Monday, Feb. 19, was Matthew Spurlock. Many might already know Spurlock as the Chief of Police in Camden, which is why he was in his Camden’s uniform during his swearing-in. In addition to his position as Camden Chief, Spurlock will now be serving with the City of Eaton in a part-time position. 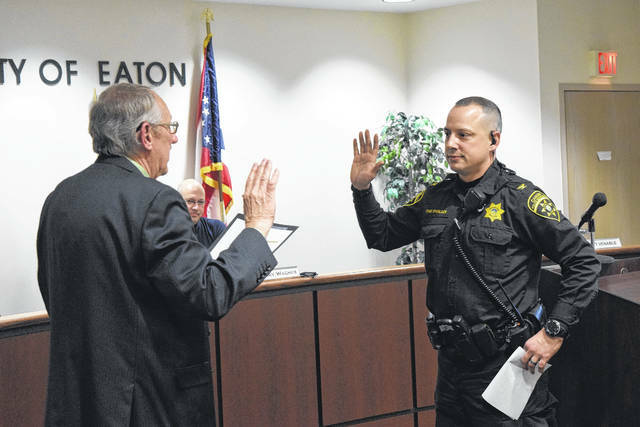 https://www.registerherald.com/wp-content/uploads/sites/41/2018/02/web1_Police1-2.jpgJamison Kuenkel was sworn in as one of the City of Eaton’s newest part-time police officers during an Eaton City Council meeting on Monday, Feb. 19. It was explained Kuenkel had recently graduated from the Police Academy and that he is starting his police career with the City of Eaton. https://www.registerherald.com/wp-content/uploads/sites/41/2018/02/web1_Police2-2.jpgThe other new part-time officer to be sworn in during the council meeting on Monday, Feb. 19, was Matthew Spurlock. Many might already know Spurlock as the Chief of Police in Camden, which is why he was in his Camden’s uniform during his swearing-in. In addition to his position as Camden Chief, Spurlock will now be serving with the City of Eaton in a part-time position.